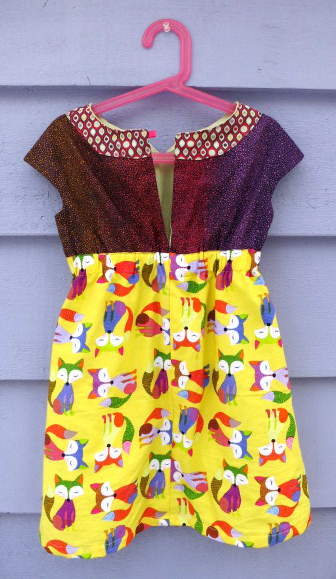 Well, I am late to this party, but I am loving the Roller Skate Dress by Oliver + S. I got my pattern on sale at Cloth and Bobbin! check them out! I finished this one over the weekend. Size 5, a little roomy on my size 4 girl so this one will last a while. She turned up her nose at the fox fabric initially, but did eventually put the dress on to wear for several hours, making the dress maker feel a little better. It is a fully lined dress which was a little unexpected. I have to search out a light weight lining, even that minty green muslin felt too heavy. That is really adorable! Can I get one in a size 4 adult using the fabric from the top all over? Kthxbye!